Preheat the oven to 350* F. Place a sheet of parchment paper over the bottom disk of an 8-9 inch spring-form pan. Fasten the ring around the disk with the parchment paper secured in between. Cut off the excess paper. Grease the sides of the pan. Whisk together the flour, baking powder, salt and ½ tsp. of pumpkin pie spice. In the electric mixer, cream 1 cup of sugar with the butter. Add the eggs one at a time. Slowly add the flour mixture. Scrape the bowl and mix again. Can you tell which one is my methodical recipe-follower, and which is my spatula-licking prankster??? Excuse our mess in the background...how embarrassing! Spread the batter evenly in the prepared pan. Slice the plums into eighths. The easiest way I’ve found to do this, is to run a knife around the plum to half it, then do the same to quarter it. Split each quarter in half. Then the little sections should pop off the pit with your knife. Place the plum slices around the top of the cake in a pretty pattern—make sure they are close together. Sprinkle 1 Tb. of sugar and the remaining ¼ tsp of pumpkin pie spice over the plums. Bake for 50-55 minutes—until a toothpick inserted into the center comes out clean. Make SURE not to over bake! Cool for 15 minutes in the pan, and another 10 minutes out of the pan before serving! Serves 8-12. * Try with fresh summer peaches, nectarines or apricots! 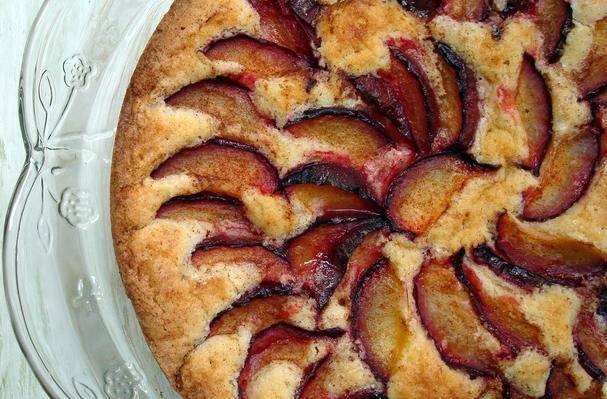 This particular cake is great for summer stone-fruits such as plums, peaches and apricots. A rustic, yet elegant cake that needs no cream or sauce to perfect it! The plums add a juicy tang to this dense buttery cake, so it's flavorful enough to stand alone. That makes it a perfect dessert to take to a BBQ or party. This is just the kind of dessert I'd wrap up and put in my picnic basket for an evening concert at the park. No hassle, big impact!